Macroevolutionary theory is still the reigning doctrine in academia and among intellectuals generally. For a large majority of Catholic and non-Catholic scientists it is the only defensible view of origins. Yet over the last fifty years signs of the growth of a formidable challenge to macroevolution have been steadily growing. The number of scientists who dissent from neo-Darwinism in the U.S.A., Europe, Australia and around the world is steadily growing and many hundreds have made their views publicly known. Why is this process occurring? Part of the reason is that recent scientific advances in molecular biology, genetics, sedimentology, information theory and other fields have cast doubt on some of the major tenets of Darwinism. Another part of the reason is that the sweeping claims of macroevolutionists have run far beyond securely documented evidence. Their large and unwarranted extrapolations (e.g., in the leap from microevolution to macroevolution) make them unique among natural scientists. The intellectual rigor that works to diminish unwarranted extrapolation from empirical data remains intact in most other scientific disciplines. The all-embracing grip of macroevolution on modern scientific thought, and especially on the thinking of academic biologists, has had an unfortunate dampening effect on open and frank discussion of problems in evolutionary theory, especially in the primary literature. As my own experience and that of many others demonstrates, there are powerful censures in academic life that sharply limit expression of doubts and dissent from evolution. These include reassignment of courses in spite of technical competence and experience, denial of research funding and laboratory space, denial of sabbatical leaves, discouraging graduate students from working with the dissenter, ostracism, and possible denial of tenure or even loss of employment. In such a restrictive climate it is not surprising that many in the academy who have private doubts about evolutionary theory choose not to make those doubts public. For an academic biologist steeped in Darwinism a change from evolution to a non-evolutionary view of cosmic and biologic origins often involves great intellectual effort and ordeal. The process can take years of intense engagement with many different sorts of technical arguments and lines of empirical evidence. In my case the process began with exposure to creationist literature for the first time in my eighth year of teaching evolution in the Biology Department of San Francisco State University after joining the faculty as a convinced Darwinist and chemical evolutionist. This material was graciously given to me by my student, Solomon Darwin. It included a book entitled The Creation of Life: A Cybernetic Approach to Evolution by A. E. Wilder-Smith. In this book Prof. Wilder-Smith gave a lengthy refutation of the thesis of Biochemical Predestination, a monograph on the origin of life I had co-authored with Dr. Gary Steinman. I told Solomon Darwin that I would read and refute Wilder-Smith’s arguments over the summer recess and would discuss the matter with him the following Fall term. As it turned out, I found that I could not answer Prof. Wilder-Smith’s case against the theory of chemical evolution after all. As he so clearly demonstrated, the crux of the origin-of-life problem was and remains the spontaneous (naturalistic) origin of genetic information. No convincing naturalistic explanation for the origin of the first genetic information has been given, nor has one been forthcoming for the origin of the new genetic information required for the supposed macroevolutionary formation of new types of organisms. “Microevolution” denotes genetic changes within species and may include the formation of some new species within genera. “Macroevolution” denotes the evolution of new species/genera and higher taxonomic categories. Journals of evolutionary biology, such as Evolution, J. Evol. Biol., and Evol. Ecol., contain many original papers on directly observed microevolutionary processes. But in these journals there are virtually no papers that claim to document direct observation of macroevolutionary change even though the journal Evolution was founded “…with the aim of mending the division” [between microevolution and macroevolution]. The paleontological literature, on the other hand, does contain abundant discussion of large-scale evolutionary change as this is thought to be exhibited by the fossil data. However, in this case one must carefully distinguish between descriptions of the fossils (and the rock strata in which they and morphologically similar fossils are found) and inferences regarding hypothetical macroevolutionary sequences. This problem is beyond the scope of this paper, but it has been analyzed extensively by both macroevolutionists and their critics. There is no significant dispute about the reality of microevolutionary processes. These are abundantly documented and accepted by non-evolutionists, but university textbooks give readers the impression that both microevolution and macroevolution have been demonstrated by empirical evidence and that both scales of evolution form one seamless garment. The textbook examples of actual living populations undergoing microevolutionary change are described in detail and are generally referenced in the primary literature. But the student soon encounters diagrams of phylogenetic trees showing, for example, the alleged origin of all of the various orders of mammals from a hypothetical common ancestor. The impression created by such diagrams, with their bold-faced solid lines linking the common ancestral species with the earliest representatives of the mammalian orders, is that an abundant fossil record documents all the proposed lineages. On the contrary, transition series of fossils bridging the gaps between major types of organisms are systematically absent from the fossiliferous strata (in spite of the existence of such intriguing fossils as Archaeopteryx, Basilosaurus isis, and the mammal-like reptiles). 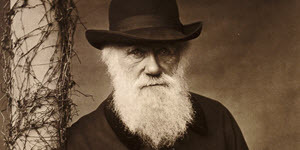 This absence of transition series may be more evident today than it was in Darwin’s day. I first became aware of this disparity between textbook claims of macroevolutionary processes (e.g., animal speciation) and the actual state of the evidence through my attempts to provide my evolution students with credible references in the primary literature. During the years that I taught our Department’s main evolution course, I could not find even one convincing primary reference that documented the formation of a new animal species, either in the laboratory or in the field. This was an astonishing fact since well over a hundred years had elapsed since the publication of Darwin’s Origin of Species. Thinking that my students could help locate the missing primary references I challenged each class for several years to bring me one reference documenting the formation of a new animal species. No such references ever appeared from the students but the challenge became known to my faculty colleagues and from time to time (about once every 2-3 years) a paper purporting to demonstrate a case of directly observed animal speciation (e.g., the formation of a new species of Drosophila in a population-cage experiment) would appear in my mailbox, sometimes signed and sometimes anonymously. In every case these few papers, on close inspection, were found not to demonstrate what their titles boldly proclaimed. There was always some problem, for example, lack of proof that the reported reproductive isolation between two subpopulations was stable over multiple generations under the conditions of the experiment. For the reasons discussed above, my doubts about the reality of macroevolution continued to grow aided by another consideration. The evolutionary formation of new genera and higher taxa would have required the naturalistic addition of substantial amounts of just the right kind of new genetic information to the genomes of the evolving organisms in order for new structural features and physiological mechanisms to develop. Such an evolutionary process would have entailed the accumulation of perhaps hundreds of favorable and coordinated mutations in the same lineage. But the overwhelming majority of documented mutations are either deleterious to the organisms in which they occur, or at best they are selectively neutral. I gradually became convinced that no naturalistic process of information increase would be found. Certainly no convincing spontaneous process for generating the new genetic information required for macroevolution was documented in the primary literature in spite of such suggestions as gene duplication followed by different mutation histories in the original and the duplicate gene. And there was another consideration: The Darwinian mechanism underlying evolutionary change involves genetic variations among the individuals in a population of organisms whose corresponding phenotypes are acted on by natural selection. The source of the (long-term) variation is mutations in the genetic material. These mutations are said to be “random” in the sense that they arise in a manner that is not correlated with the adaptive needs of the organisms in their environment. In this sense the mutations that contribute positively to the organisms’ overall fitness (i.e., improve their competitive advantage) occur fortuitously. But notice that it is assumed here that the mutations will in fact range over a sufficiently wide spectrum to guarantee that among them there will always be some that contribute to the formation of new adaptive traits. But the genomes of organisms have powerful built-in limitations on their variability. And macroevolutionists themselves are providing evidence that “adaptive landscapes” constrain what natural selection can achieve in evolving populations. All of these converging difficulties made it appear less and less likely that macroevolution had occurred. And the intellectual situation in my own area of research, the origin of the first life, deepened my doubts about macroevolution, and in fact pushed them to the breaking point. At the very least we can conclude that Darwinism is no longer the impregnable fortress that it has seemed to be for so many scientists and other intellectuals for so long. The number of scientific dissenters continues to grow, and this remarkable process is likely to accelerate as the problem of the origin of genetic information is squarely faced by larger segments of the scientific community. The process is occurring in many different countries among Protestant, Catholic and Orthodox Christians, Jews, and Muslims, as well as agnostics. But a large majority of academics apparently remains convinced of the fundamental soundness of the evolutionary account of biologic origins. For the non-biologists among them, and even for many biologists who specialize in fields other than evolution, this confidence is more often based on trust than on familiarity with the details of the empirical case for evolution. And then there are those who have doubts about one or another aspect of Darwinism, or macroevolution, but for personal reasons do not want to dissent openly. It is my own strong conviction that we now have enough empirical evidence and sound scientific argument to support a vigorous reassertion of the Catholic Doctrine of Creation as understood by the Fathers and Doctors of the Church. The many scientific problems of Darwinism should be widely debated, both inside and beyond academia. Such discussions within academic science and in national cultures generally should be broadly encouraged. If offered encouragement from the Holy See, many academics would join the discussion who have heretofore been hesitant. A large, world-wide change in the intellectual climate could follow quickly upon such a gracious and magnanimous show of support from theVatican. Dr. Kenyon received his Ph.D. in biophysics from Stanford University in 1965 and completed post-doctoral work at U. C. Berkeley, Oxford University, and NASA. “Macroevolution” denotes the evolution of new species/genera and higher taxonomic categories. See below. Neo-Darwinism (or simply Darwinism for convenience) denotes the view that the diversity of living organisms is the result of a materialistic and unplanned natural process starting with the first living cells. The Darwinian mechanism of evolutionary change involves fortuitous genetic variation among the individuals in populations and natural selection of the most fit variants resulting in the formation of new species from ancestral species. In this manner all of the fossil and living microbes, plants and animals evolved over billions of years. S. G. Meyer 2004, The Origin of Biological Information and the Higher Taxonomic Categories, Proc. Biol. Soc. Washington 117(2): 213-239. S. M. Stanley 1979, Macroevolution: Pattern and Process, W.H. Freeman,San Francisco, p.2. Op. cit. ; S. J. Gould 1977, Evolution’s Erratic Pace, Nat. Hist. 86(5), 12-16. D. Raup 1979, Conflicts Between Darwin and Paleontology, Field Mus. Nat. Hist. Bull. 50: 22. J. C. Sanford 2005, The Mystery of the Genome, Ivan Press,Lima,N.Y., Chap. 9. M. J. Behe and D. W. Snoke 2004, Simulating Evolution by Gene Duplication of Protein Features That Require Multiple Amino Acid Residues, Protein Sci. 13: 2651-2664. For an analogous consideration applied to the origin of the first living cells, see D. H. Kenyon 1974, Prefigured Ordering and Protoselection in the Origin of Life, in The Origin of Life and Evolutionary Biochemistry, Festschrift Volume for Prof. A. I. Oparin (K. Dose, S. W. Fox, G. A. Deborin and T. E. Pavlovskaya, Eds. ), Plenum Press, New York, pp. 207-220. S. P. Miller, M. Lunzer and A. M. Dean 2006, Direct Demonstration of an Adaptive Constraint, Science 314: 458-461.